In an email to supporters last week, Republican gubernatorial candidate Phil Scott's campaign manager crowed that "a remarkable 97 percent of Phil's donors are Vermonters." That might not hold true after tonight, when the incumbent lieutenant governor holds a fundraiser at a Washington, D.C., lobbying firm hosted by four registered lobbyists. According to an invitation obtained by Seven Days, Oklahoma Gov. Mary Fallin and Iowa Lt. Gov. 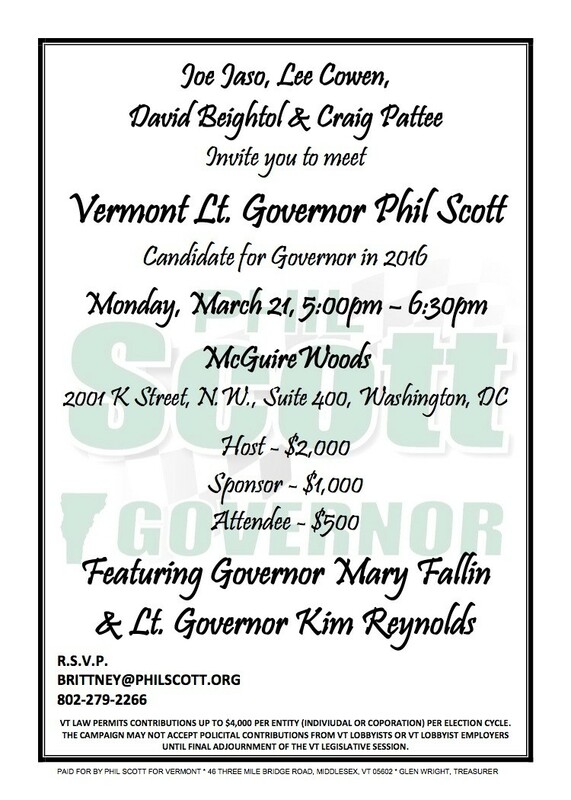 Kim Reynolds are the featured guests at the Scott fundraiser, which will take place at McGuireWoods' D.C. office. The firm's top clients include cigarette conglomerate Altria Client Services, the American Petroleum Institute and ExxonMobil, according to the Center for Responsive Politics. Tickets range from $500 to $2,000. The fundraiser's hosts include McGuireWoods lobbyist Joe Jaso Jr., Cowen Consulting lobbyist Lee Cowen, Flywheel Government Solutions lobbyist David Beightol and Agenda lobbyist Craig Pattee. Both Jaso and Pattee represented former Vermont governor Jim Douglas in Washington during his tenure. Brittney Wilson, Scott's campaign manager, says the fundraiser was organized by the Republican Lieutenant Governors Association and that Scott had met the hosts at previous RLGA events. She says he has no reservations about holding a D.C. fundraiser hosted by registered lobbyists. "I would say that this is all within campaign finance law. It's an allowable tool," she says. "Just like the other candidates have raised money out of state, we plan to do some fundraising as well." Scott plans to take part in the event at the start of a four-day trip to D.C. for a meeting of the nonpartisan National Lieutenant Governors Association. According to his chief of staff, Rachel Feldman, Scott's state office will pay for his hotel stay on Tuesday and Wednesday. His campaign will foot the bill for travel and his Monday night accommodations, following the fundraiser. Christina Amestoy, a spokeswoman for the Vermont Democratic Party, faults Scott for accepting support from Fallin, who opposes abortion and gay marriage. She notes that Cowen is also a prominent fundraiser for New Mexico Gov. Susana Martinez, who chairs the Republican Governors Association. 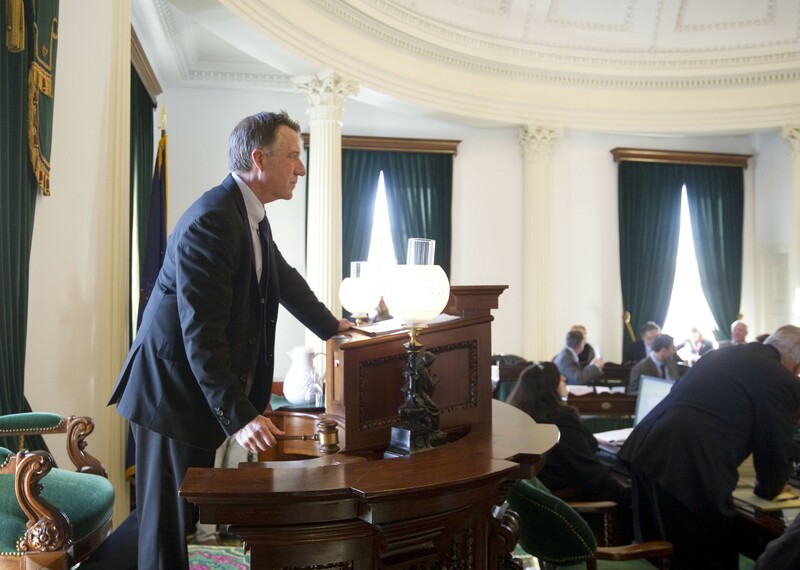 "This fundraiser is another example of Phil Scott's alignment with the knee-jerk conservative wing of the national Republican Party, rather than with Vermont interests," Amestoy says. "And I think if he can attract the same supporters who backed elected Republicans like Gov. Fallin and Gov. Martinez — both of whom have adamantly pushed a far-right agenda — then it looks like he may not be as dedicated to the moderate, commonsense leadership that he says he is." According to Wilson, Scott does not necessarily agree with Fallin on every issue. "As you know, Phil has his own views," she says.